Some Hot Wheels collectors out there are called “Error Junkies” or “Variation Spotters”. They are in search of Mattel’s mistakes on the assembly line. This particular ’68 Chevy Nova is special in two ways. It is a variation of the 2009 Faster Than Ever Series release in that it has Chrome Open-Hole 5-Spoke Wheels (OH5), versus the Copper-colored ones the Faster Than Ever (FTE) one has. To add to that, it also has All Large Wheels (ALW) which is considered in error since this casting normally has smaller wheels in the front than in the rear to give it the “raked” look that is synonymous with Hot Wheels. This item was sold on June 10th, 2015 and is headed to its new home in Washington. 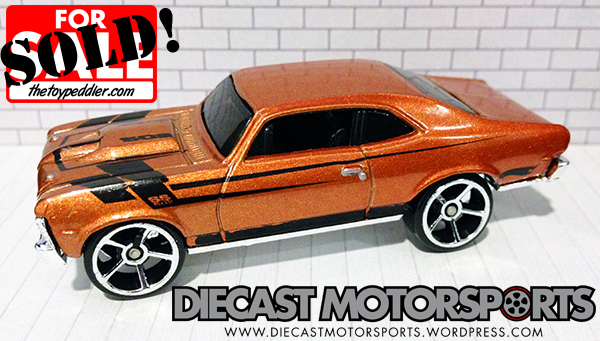 RELEASE DETAILS: Metalflake Copper Body (metal). Black Interior. Dark-Tinted Windows. All-Large-Wheel (ALW), Chrome Open-Hole 5-Spoke (OH5) Wheels. Chrome Base (plastic). Made in Malaysia.